Sno-Way Snowplows | Interchangable Snowplow Blade Skins Sno-Way Snowplows: Stronger. Smarter. Better. Choose an Option for more information. Polycarbonate is a high strength, flexible material; so durable that it has been used for cockpit windows on jet fighters and the windows of the President's limo. 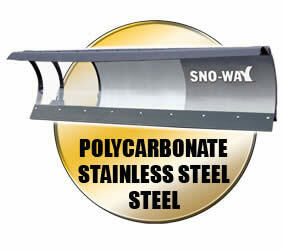 Polycarbonate offers additional benefits over steel that makes it the smart snow plowing choice. Polycarbonate Blades are a patented technology only from Sno-Way International. High strength powder-coated steel provides a great value and durable finish. The proven choice for over 75 years. Long lasting, requires less maintenance, tough and efficient.